Anglo/British Israelism Herbert W. Armstrong REFUTED! Herbert W. Armstrong claimed to be a prophet, an apostle and the "Elijah who was to come". In fact he was a deluded false teacher claiming direct revelation from God when God had not spoken to him. Ronald Weinland, is Armstrong's successor of splinter group called, Church of God, Preparing for the Kingdom of God (CG-PKG). Like Armstrong he claimed to be a prophet, one of the two witnesses of Revelation, a Apostle and Elijah to come. With Ronald Weinlands failed predicting of the end of the world in 2008, the future of Armstrongism looks bleak. "If it doesn't come to pass...starting in April, 2008, then I'm nothing but a false prophet ... (Ronald Weinland, 2008 - God's Final Witness, Church of God) Even worse since Ronald Weinland has refused to give up his date setting and had set a second failed date of May 27, 2012. See our main Rapture page here. Britain and the USA (anglo-saxon) races are NOT the ten tribes of Israel. 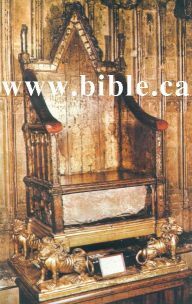 Pictured is the old coronation chair in Westminster Abby, London England. Under it lies a stone which British/Anglo-Israelites imaginatively claim was brought to England by the prophet Jeremiah! 1. British Israelism promotes the false concept that the British people and most of Canada and the USA are the ten lost tribes of Israel that went into Assyrian captivity in 722 BC. 3. Richard Brothers (Canadian) is the true founder of the movement when he wrote: A Revealed Knowledge of the Prophecies and Times in 1794 AD. His prediction for the end of the world which failed. 4. Herbert W. Armstrong popularized the false doctrine in 1954 when he published "The United States and the British Commonwealth in prophecy". This document grew to the now infamous, "The United States and Britain in Prophecy" which was first published in 1980 AD. 5. 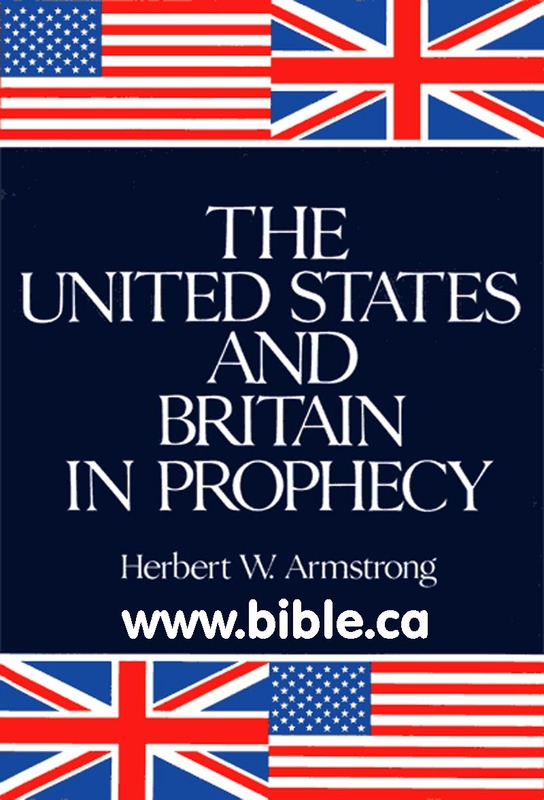 The book, "The United States and Britain in Prophecy", written by Herbert W. Armstrong, is in fact a deceitful plagiarism of a book written, "Judas' scepter and Joseph's birthright" by J. H. Allen, 1902,1917 AD. 6. Herbert W. Armstrong founded the Plain Truth magazine and the Church of God. 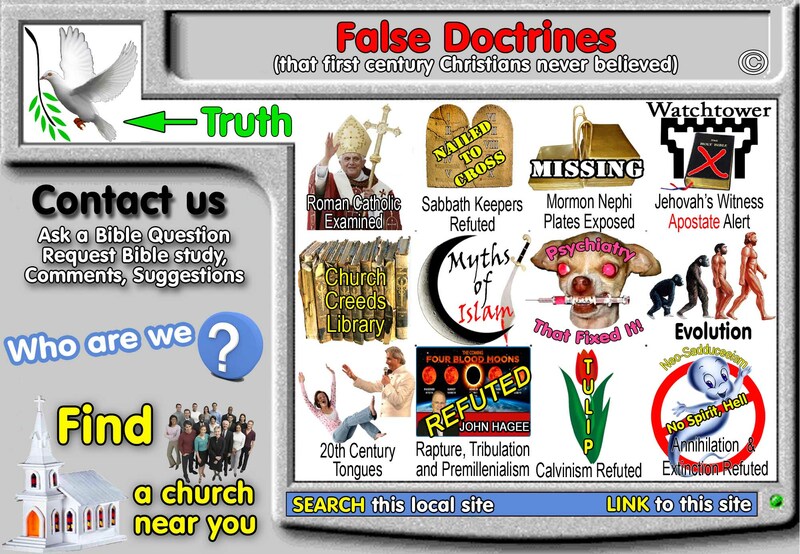 They teach extinction, annihilation, Sabbatarians, premillennialists, date setters and uniquely Twinitarians in that they believe both the father and the son are God, but believe the Holy Spirit is electricity like the Jw's. 2. Brothers, Richard (1757-1824) British religious fanatic and ex-naval officer, born in Newfoundland, Canada. He announced himself in 1793 as the 'nephew of the Almighty', apostle of a new religion, the Anglo-Israelites. In 1795, for prophesying the destruction of the monarchy, he was sent to Newcastle and subsequently to an asylum from 1795-1806. Despite this, and the failure of his prophecy that Jerusalem would be restored to the Hebrews in 1798, his movement flourished. By the end of the nineteenth century, there were said to number two million adherents of British-Israelism, most of them Church of England members. 3. In 1859, John Taylor of London expanded the theory into the field of Pyramidology. In the book The Great Pyramid, Why Was It Built and Who Built It? John Taylor tried to show how Israelites built the Pyramid of Cheops, and how British Inches and measurements could be found in its design. 4. In 1950 this outrageous doctrine was promoted by Herbert W. Armstrong who founded the World Wide Church of God and Plain Truth Magazine. 5. After Armstrong died, his successor Joseph Tkach rejected as heresy most of Armstrongs doctrines in 1998 AD. This brought about a great split in the church that produced countless little splinter churches each following a different combination of Armstrong's theology. 7. Ronald Weinland, is the creator of an Armstrong splinter group called, Church of God, Preparing for the Kingdom of God (CG-PKG). With Armstrong splinter leader Ronald Weinland's failed predicting of the end of the world in 2008, the future of Armstrongism looks bleak. 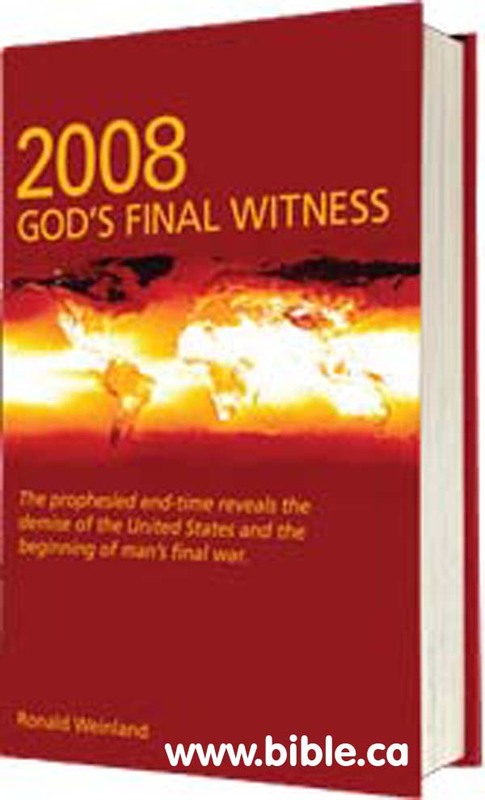 Ronald Weinland, 2008 - God's Final Witness, Church of God (Armstrong splinter group) When his prophecies failed, he revised his timeline he stated Christ's will now return on May 27, 2012 and that the tribulation began on September 20, 2009. Today, Weinland calls himself an apostle a prophet, the "Elijah who is to come" and one of the two witnesses of Revelation... his wife being the other witness. 1. The book, "The United States and Britain in Prophecy", written by Herbert W. Armstrong, is in fact a deceitful plagiarism of a book written, "Judas' scepter and Joseph's birthright" by J. H. Allen, 1902,1917 AD. 4. William F. Dankenbring, Armstrong splinter group leader of Triumph Ministries said: "Let's get serious! Did Herbert restore the truth of the identity of "Israel"? But the British-Israel society restored that truth, and Herbert Armstrong simply borrowed it from them without giving them due credit! Most of his booklet on "The United States and British Commonwealth in Prophecy" was actually copied, word for word, from the book Judah's Scepter and Joseph's Birthright, by J. H. Allen (Destiny Publishers, Merrimac, Mass. 01860, c.1917). The booklet "Was Time Lost?" which bore Herbert's name was actually written years before he became a Sabbath keeper, by a member of the Church of God Seventh Day!" The name Jew is derived from, or rather is a corruption of, the name Judah.... Hence it is that the names Jew and Jews are applied only to the people who composed the kingdom of Judah (p. 66). Remember that the term "Jew" is merely a nickname for "Judah." Hence, it applies to only to the one nation, or House of Judah ONLY (p. 80). But the great bulk of Israelites are not the Jews, just as the great bulk of Americans are not Californians, and yet all Californians are Americans (p. 71). Jews are Israelites, just as Californians are Americans. But MOST Israelites are not Jews, just as most Americans are not Californians (p. 82). Called as the prophet of God; ... and set by the Divine One "over the nations, and over the kingdoms." What! Surely he was not set over all the nations... He now calls Jeremiah a "Prophet unto the nations," i.e. the "two nations," the "two kingdoms," the two houses--Israel and Judah (p. 108). Notice, Jeremiah was set over NATIONS -- more than one kingdom... He was set a prophet over Judah -- but not Judah alone. Over nations -- over kingdoms!.... Jeremiah was set over not just one nation, Judah -- but over NATIONS. Over the kingdoms -- the Kingdom of Israel as well as Judah! (pp. 95-96). "The United States and Britain in Prophecy"
This contradicts the book of Revelation! This false view is foundational to many of Armstrong's views! The river of Egypt CANNOT be the Nile! "Joseph is a fruitful bough by a well whose branches run over the wall" p46 "Over the wall is obvious proof that they would "run over, or past the nation's boundary - in other words, be a colonizing people!" Premillennialists always take literal passages that should be taken symbolically and take symbolically, those passages that should be taken literal! Yet using their logic, none of those branches could run to England! For within the same prophecy Jacob said 4 verses later: "Up to the utmost bound of the everlasting hills" which in Armstrong logic means that the land must have high mountains! (England has no mountains) Such interpretations are as ridiculous as they are false! "And so, because David was a prophet, and knew that God had sworn to him with an oath to seat one of his descendants upon his throne, 31 he looked ahead and spoke of the resurrection of the Christ"
This verse absolutely and conclusively proves that Jesus was seated on the Throne of David at His resurrection! The house of Israel was in Judah during the personal ministry of Christ.—Matt. 10:56. They did 2 Kings 17:22-24 says they were settled and assimilated into Assyria! "The Eternal would cease speaking to them in their own Hebrew tongue, but with "another tongue will he speak to this people" Isa 28:11. This cannot apply to the Jews, who still read their Bible's in Hebrew tongue." Incredible twisting of scripture by Armstrong! Actually Isa 28:11 is quoted in full in 1 Cor 14:21 ""By men of strange tongues and by the lips of strangers I will speak to this people, and even so they will not listen to Me," says the Lord. 22 So then tongues are for a sign, not to those who believe" So the "strange tongues" is not a prophecy of moving to Britain and learning English but a prophecy of the GIFT OF TONGUES MANIFEST IN CORINTH, and throughout the first century! Armstrong's scriptural proof that Israel would change the name they are called from Jew to ??? Fulfilled: The new name is CHRISTIAN! Praise God! Well Herbert, we have looked at your only two proof texts and they were wildly twisted out of context! So your point is not proven one bit! Twisting again, read the verse! Notice it mentions "House of Judah" not "House of Israel". Of course all this is pure fantasy and very anti-scriptural! The "tender twig" in Ezek 17:22 is not a female, but JESUS CHRIST! This is a messianic prophecy! Isa 53:2 "For He grew up before Him like a tender shoot, And like a root out of parched ground"
Only Armstrong would twist scripture to such an incredible and unprecedented extent! The "many days without a king" for Israel, who is about to go into captivity is till the time of Christ! Who is the real King of Kings! Not some fantastic imagination story! The east wind refers to a wind of destruction! not some treasure or road map. Re-read Hosea 12:1 and you will see the thought is absolutely parallel with the two passages below: Where does Armstrong dream up this wild stuff? (well actually, we already know he plagiarized it all from another book, then said as a prophet, God revealed it to him! Incredible! But get this! Armstrong is using (twisting and contorting) this verse as a treasure/road map to show you the exact prophesied route of travel! Now if "from the North and from the west" means draw a line from Jerusalem to England, then "from the land of Sinim" means draw a line from Jerusalem to Australia! Two opposite directions Armstrong! (We do not agree that Sinim means Australia. Truth is no one knows for sure. But we are merely defeating Armstrong with his own wild speculations! 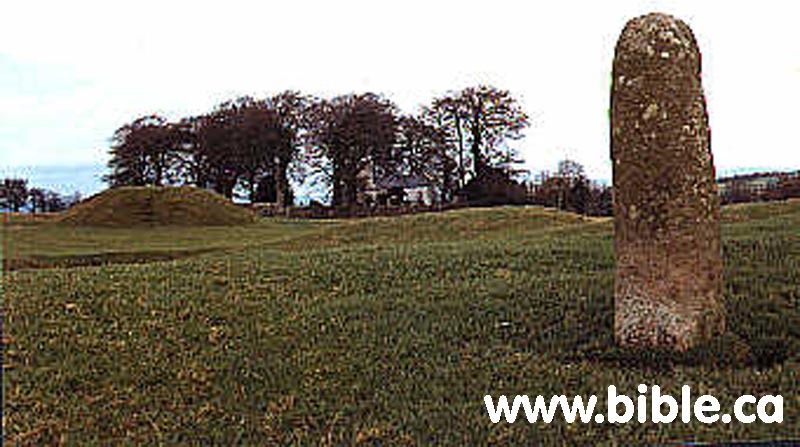 The Hill of TARA in the Royal County of Meath was for centuries in ancient times the seat of the High King of Ireland, the Ard Ri. This monolith is called the Lia Fial, The Stone of Fal or the Stone of Destiny. Fokelore story: The tradition is that the High Kings of Ireland would be crowned here, and that the Stone would roar or cry out loudly if touched by the true High King. Some believe that the original Stone of Fal was taken to England and placed under the Coronation Throne in Westminster Abbey, then in the current Century stolen, taken into safe keeping in Scotland. Who now knows which is the true Lia Fial or where it lies! Here is the actual Lia-fial stone! Notice that Lia-Fial is not written on the stone under the coronation chair! So just another example of Armstrong's imagination being played with by Fables! Stone of Scone, Jacobs Pillar? This monolith is called the Lia Fial, The Stone of Fal, Stone of Scone, Jacobs Pillar, Stone of Destiny. 1. British Israelism is going extinct... what took so long? 2. There is no scriptural foundation for British Israelism. 3. Herbert W. Armstrong claimed to be a prophet, an apostle and the "Elijah who was to come". In fact he was a deluded false teacher claiming direct revelation from God when God had not spoken to him. 4. Ronald Weinland, is the creator of an Armstrong splinter group called, Church of God, Preparing for the Kingdom of God (CG-PKG). With Ronald Weinlands failed predicting of the end of the world in 2008, the future of Armstrongism looks bleak. 5. See our main Rapture page here.